Cow Island Lake is the best place in Louisiana to photograph Osprey on the Nest. In a typical year there are at least a dozen nests many of which are located on cypress stumps just over the water. Cow Island Lake is just South of Butte LaRose off the Atchafalaya River. Access to the Lake is by boat from the Atchafalaya and is limited to when the the River Level at the Butte LaRose Gauge is at or above 15 feet. Unfortunately that limits visits to the Lake to just a few days in the Spring. 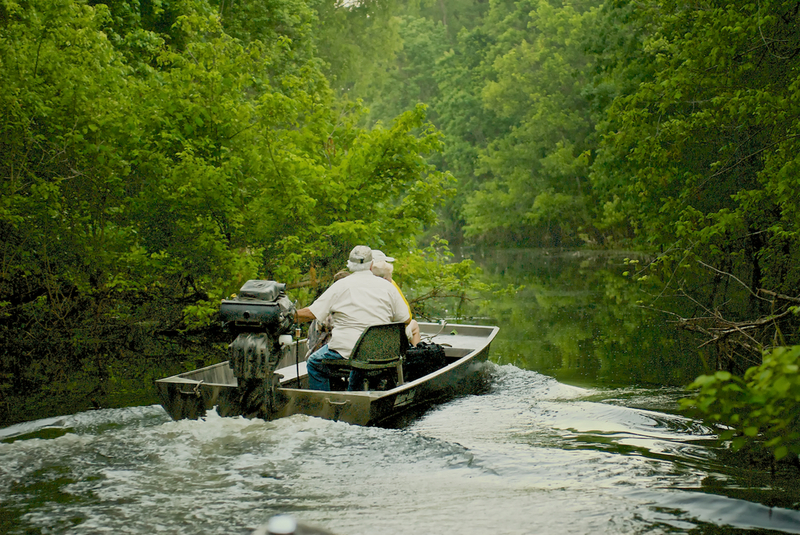 From the Atchafalaya access is through a small canal over a steel weir into the Lake. Due to the numerous nests just above the water it is one of the few places you can photograph the birds in flight against a green background. Since the birds always land and take off into the wind, the best shots are obtained when there is an Easterly wind in the morning or a Westerly wind in the afternoon, although good silhouette shots can be obtained at sunrise or sunset with the wind in the opposite direction. On my tours I pick the day to visit the Lake to have the most favorable light and wind conditions. 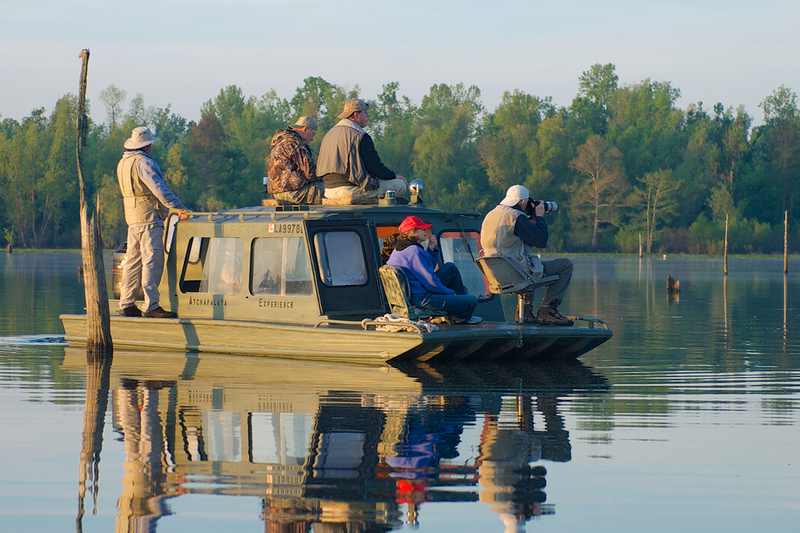 Excellent shots can be obtained from a boat close to the nest or a floating blind. Camouflaging the boat or blind helps reduce stress on the birds and allow the photographer to photograph the bird going about its normal activities. If you're interested in photographing the Osprey keep an eye on the River Levels and contact the folks at The Atchafalaya Experience to book a boat trip. I also include a trip to the Lake with my tours whenever water levels permit. Nest building activity begins in late Winter. A trip in February will find the birds collecting and placing sticks on the nest as well as courtship between the males and females. Frequently there are incidents with younger male birds trying to take over an older males mate, leading to aggressive behavior. By April the Females are on the nest and the male is out catching fish. The male typically catches the fish and consumes it in a tree nearby the nest. Only after he has his fill does he typically share his catch. May brings chicks on the nest with both parents out catching fish and periodically bringing the fish to the nest. In April and May of 2011 floodgates were opened into the Atchafalaya River Relieving potential flooding of the Mississippi River. Many of the nests at Cow Island were covered by the high water at the peak of nesting season. A rescue team rescued many of the chicks, raised them in captivity and then released them after the water receded. Cow Island Lake provides excellent opportunities to photograph Osprey. Unfortunately access is limited to those times with sufficient water. The number and the low height of the nests allow shots with very nice backgrounds.